Paying for transportation to work day after day can be expensive. Fortunately, there’s an alternative that saves money while making everyone happier.Offered through employers, our annual Perk Pass Program provides affordable bus passes that can reduce employee transportation costs and stress levels. Employers benefit as well by having happier employees and reducing payroll taxes while participating in a reliable mass transit program. 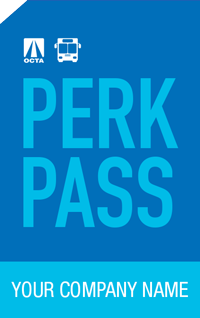 OCTA’s annual Perk Pass is a swipe-card that can be used on any local OCTA fixed-route bus. When employees board a bus for work or play, they simply swipe their card in the farebox. That’s it! OCTA provides the cards for free. To qualify for the Perk Pass Program, a company needs only 10 or more bus-riding employees. The Perk Pass is an exceptional value; it’s the only way employees can get the lowest available fare per ride that we offer. Each ride costs only $1.25 per boarding. The maximum cost per month for each participating employee is $69, no matter how many bus trips are taken. OCTA tracks usage and sends out one simple monthly billing statement. Employers can choose to subsidize all or part of the cost or pass it on to employees – either way, everyone wins. Depending on how it’s set up, Perk Pass can result in tax breaks for employers and employees. Options include having employees pay using pre-tax dollars, having employers and employees share the cost, or having employers offer it as qualified tax benefit that helps them save on federal taxes. If you’re an employer who is ready to roll with a great program that will benefit you and your employees, we can help. Meet with us to discuss the annual Perk Pass Program and we’ll give your company 5 free daily passes (a $25 value). With these passes, employees can experience the convenience and ease of taking an OCTA bus to work. To help employees learn about the program, we’ll provide marketing materials and offer presentations. Once you have at least 10 employees, let us know and we’ll get you started. Perk Passes will be mailed out within just a few weeks. We’ll help you kick off the new program with a rideshare fair at your workplace. Of course, we'll provide ongoing support and resources to help make your program a success.